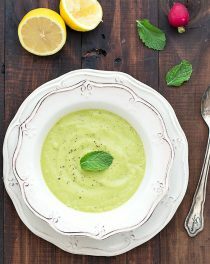 This chilled asparagus avocado soup couldn’t be easier to make and it’s perfect for those days when you want something light, cool and refreshing! The color just screams springtime and freshness. 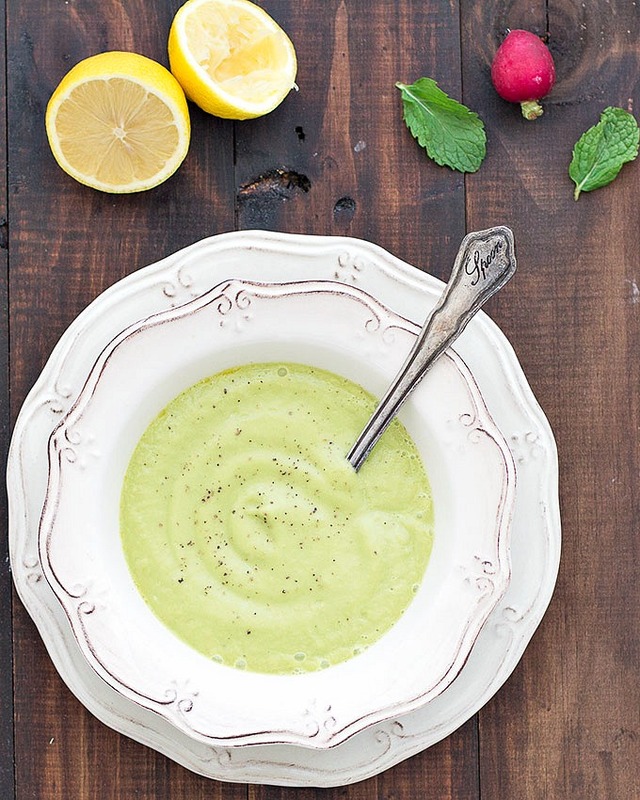 Avocado replaces the cream and makes the soup super creamy, velvety and thick. Use an overripe avocado, it will be easier to blend it in the soup. 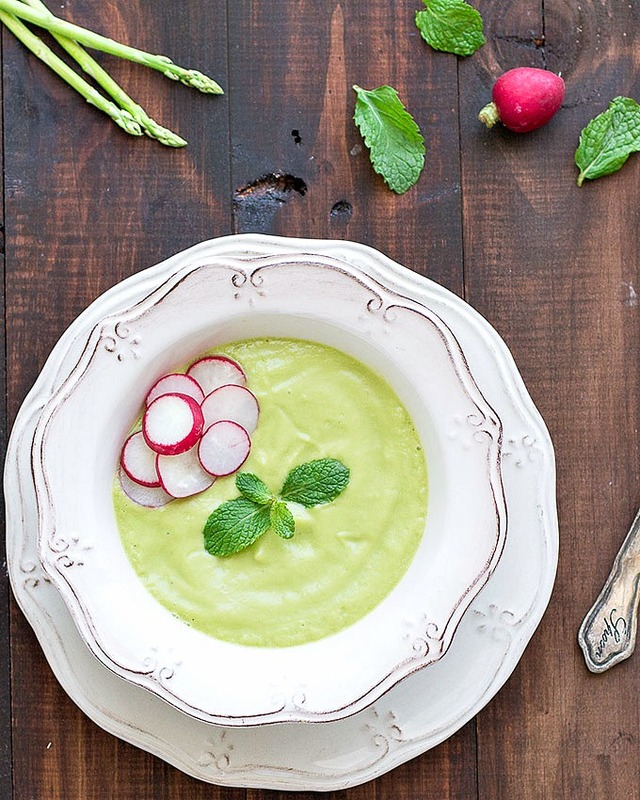 I topped the chilled asparagus avocado soup with sliced radish and freshly ground black pepper, feel free to top it with sour cream, Greek yogurt, herbs, asparagus spears or leave it plain…it will still taste delicious! The hard part is waiting for it to chill, but you could definitely eat it warm too. I ate it warm the first night and then had the leftovers chilled, which was even more tasty. 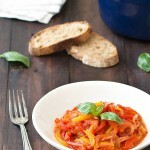 As you can make this soup in advance, it’s great for entertaining. 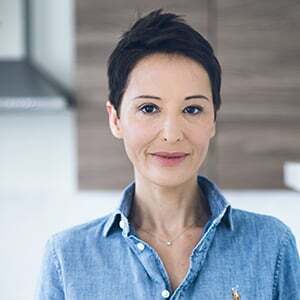 I know not everyone is fond of cold soups, but give it a try. This chilled asparagus avocado soup will become a favorite in your house too! In a large pan, heat the olive oil. Add the onion and cook it over medium heat until it's soft and translucent. Add the asparagus, and sautee for 3 minutes. Add the vegetable stock, bring to a boil then reduce to a simmer and cover. Cook for another 10 minutes and then remove the pot from heat. Allow the soup to come to room temperature. Add the soup, avocado, and lemon juice to a high powered blender and blend until creamy. Add more stock if it's too thick. 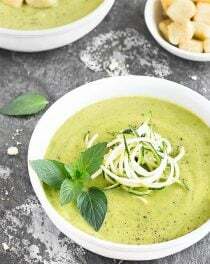 Chill the asparagus avocado soup in the refrigerator for at least one hour before serving. 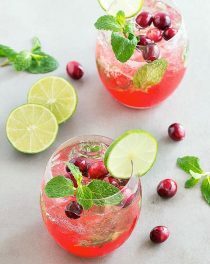 Garnish with sour cream, herbs, asparagus spears or sliced radish if desired.